One of the outstanding features of the IRt/c is its speed of response – 0.05 to 0.2 seconds. This attribute makes it possible to monitor the temperature of fast moving materials in production lines, and rapid heating and cooling. For applications in which high speed is required, care should be taken in selection of the readout device, since most thermocouple readouts are much slower than the IRt/c. Accordingly, the IRt/c signal can be modeled analytically for applications in which faster speeds are required. For any given IRt/c, the time constant will be repeatable to within a few percent, and thus can be successfully modelled. A common limitation in applying the IRt/c to high speed applications is the transit time of the target across the field of view. 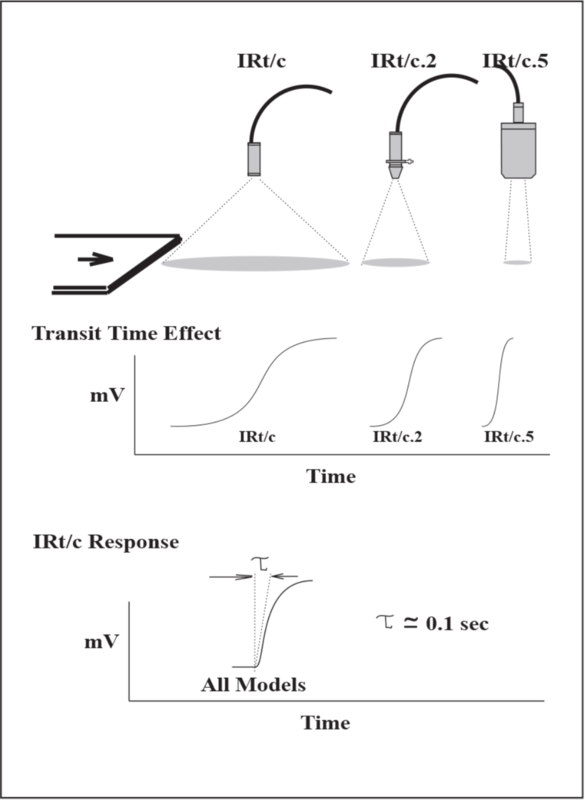 The characteristic time constant equation of response applies to the IRt/c response only. If the target requires time to completely fill the field of view, the transit time must be added to the IRt/c time constant. For best results, place the IRt/c as close as possible to the target to minimize the spot size, and therefore the transit time effect.